This is a great garden to visit if you like gardening with edibles! 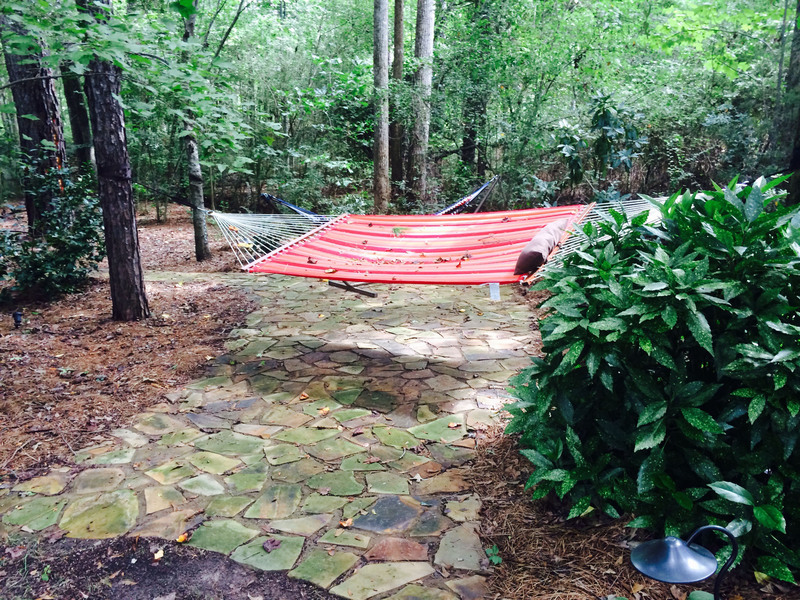 One of the first things visitors see upon entering the backyard is a cozy bench in the shade of a muscadine arbor. A productive vegetable garden is attractive with the addition of colorful flowers and decorative touches. An efficient composting system provides nutrients to amend the clay soil. Blueberries, raspberries and blackberries line the back of the property. A charming potting shed creates a focal point toward the back of the yard while providing Shirley a great space to start her seedlings. This park on the eastern edge of Gwinnett County is a hidden gem! The park consists of 25 acres of gardens that once surrounded a private estate. Vines Mansion still stands and currently operates as an event facility. 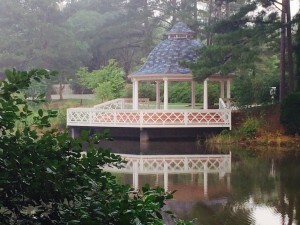 The gardens are now part of the Gwinnett County Parks Department. The Gwinnett County Master Gardener program provides volunteers who help with maintenance as well as grant money for ongoing projects. This beautiful park contains a formal rose garden, a woodland garden, a Japanese inspired garden, and a brook garden. A whimsical railroad garden runs through a miniature town. A path leads visitors around serene Swan Lake over a charming bridge that would be at home in Monet’s garden. 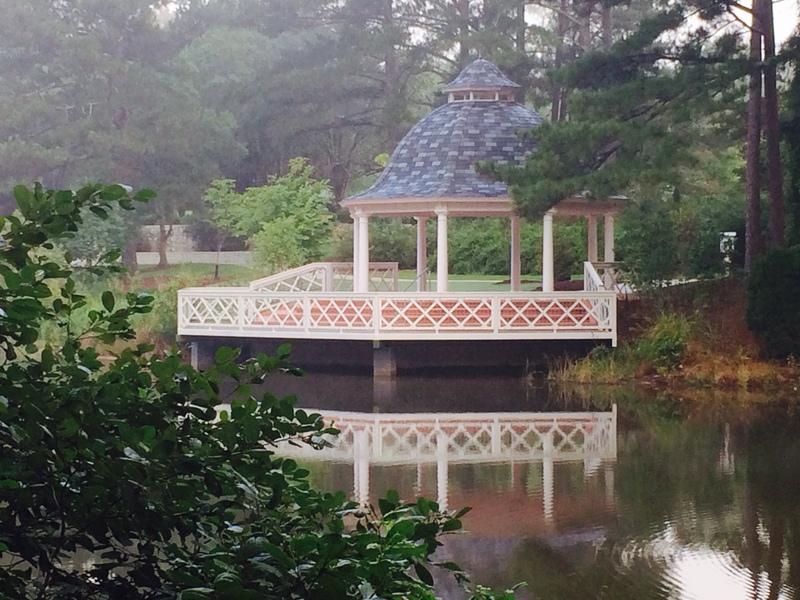 The beautiful gazebo is the perfect place to sit for a spell and watch the wildlife like the kingfishers and blue herons that call the pond home. Bluebird boxes dot the space and provide nesting opportunities. Many native trees, shrubs and perennials such as plum leaf azalea, winterberry, sweet shrub, Turks cap, and bottlebrush dot the grounds. More unusual plants not commonly found such as an evergreen wisteria and a tree with roots growing over a boulder can also be seen. Learn about the traditional design elements characteristic of Japanese gardens at Vines Park. 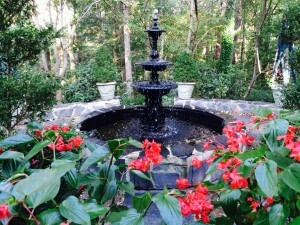 Joan’s love of fresh-cut flowers influenced her choice of plants in this colorful garden. Each season, there is something blooming that can be added to a flower arrangement and enjoyed inside her home. Joan’s garden provides solace and joy for her and others. The front yard plantings are kept low maintenance and consist of crepe myrtles, tea olives, boxwood and nandina. The South side of the garden is where Joan grows peonies, gerber daisies, weigela, wisteria, verbena and her cutting flowers. The shady north side contains a variety of hosta. 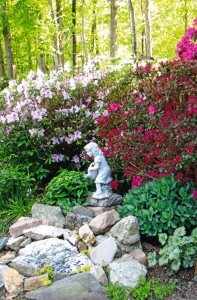 Many varieties of azalea, camellia and hydrangea dot the backyard. A 50 ft. greenbelt runs along the back of the garden where Joan has cleared the woods adjacent to the school behind her property. Circular gardens with many different plant varieties create a mini botanical garden where Joan has repurposed old vinyl blinds to create plant markers to educate visitors. This garden is a “must see” for visitors wanting to learn to create a bountiful cutting garden. Deborah’s backyard sanctuary is the perfect spot to sit and relax. This secret garden is affectionately referred to as “Breezy Gardens” by their friends and family. 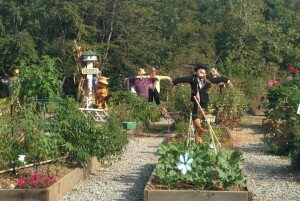 The garden has several spaces that each have unique features. 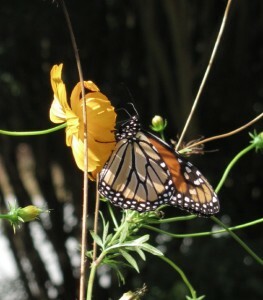 As visitors enter the garden, they will find edibles tucked into pockets of sun along the mixed flower beds. A soothing water feature with goldfish draws visitors into the space. An herb garden is both beautiful and functional. 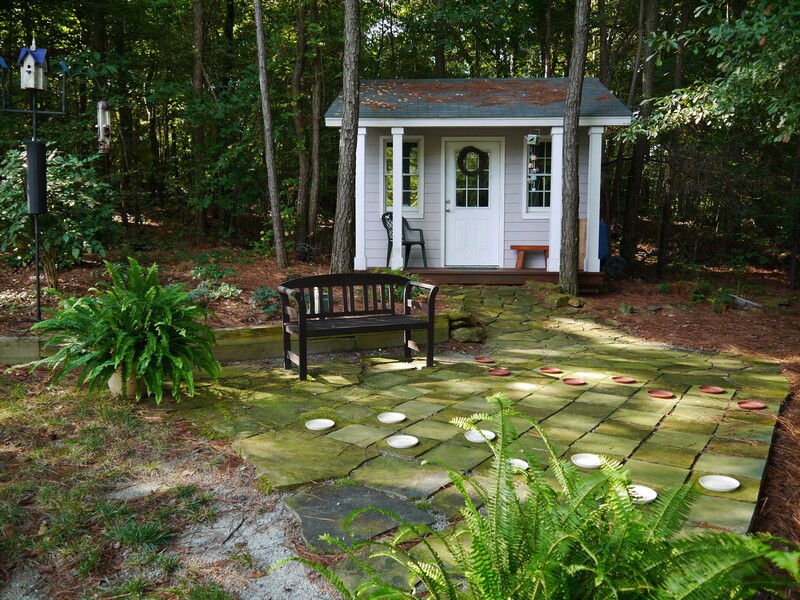 A winding path created with stone containing bits of sparkly micah, leads to a charming potting shed which creates a focal point in the back corner of their yard. This path, called “the stairway to heaven,” leads visitors past various perennials and shrubs. A giant checkerboard created using square pavers is a whimsical touch that provides a fun way to pass the time. Don’t miss the their back porch filled with vintage finds and a comfy porch swing! The design and maintenance of water features is just one of the many things visitors will learn about here. Carol’s garden feels like a mountain retreat. The cool shade created by the mature trees and the soothing sound from the nearby creek offer a welcome respite. When they bought their home 14 years ago, the back yard was a sharply sloped, wooded space. Water drained from the street into a swale that emptied 6 feet from the corner of their home, causing major erosion issues. 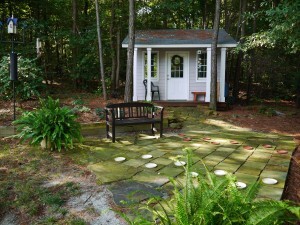 By moving the drain and regrading the property, they created a level yard and a shady garden retreat. A woodland path leads past the creek and meanders to a brightly colored hammock on its way through an arbor to a cozy seating nook. 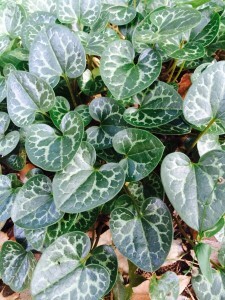 Shade loving evergreen shrubs such as Acuba japonica and perennials such as Christmas fern lend structure to the garden. Visitors will enjoy seeing the creative use of space under the two story deck. This garden illustrates how to create useable space out of a shady wooded hillside. The Camp Creek Greenway is a four mile trail that runs east-west through Lilburn. This scenic trail traverses woodlands and wetlands for much of its journey. Deer, rabbits, foxes, owls, and other birds are often spotted in this natural setting. 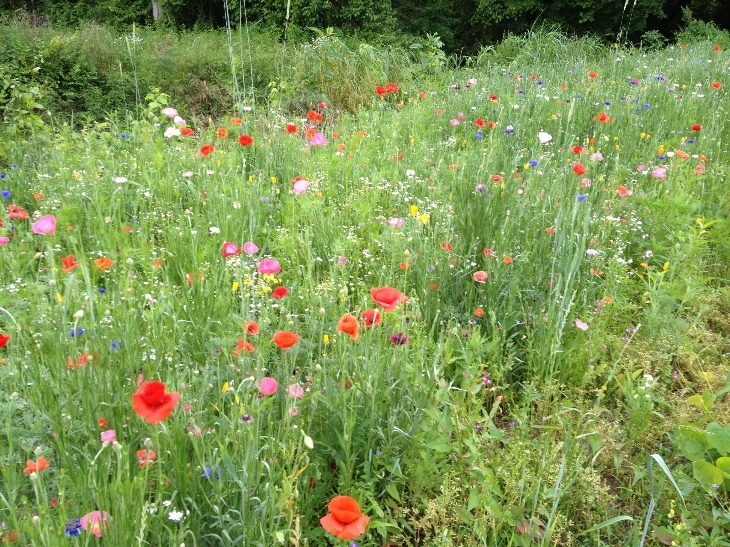 The Ladybug Garden Club is responsible for creating and maintaining attractive planted islands and a wildflower area that add color and beauty to the trail. A meditation garden has recently been added to a shady area along the creek with donations from the community. 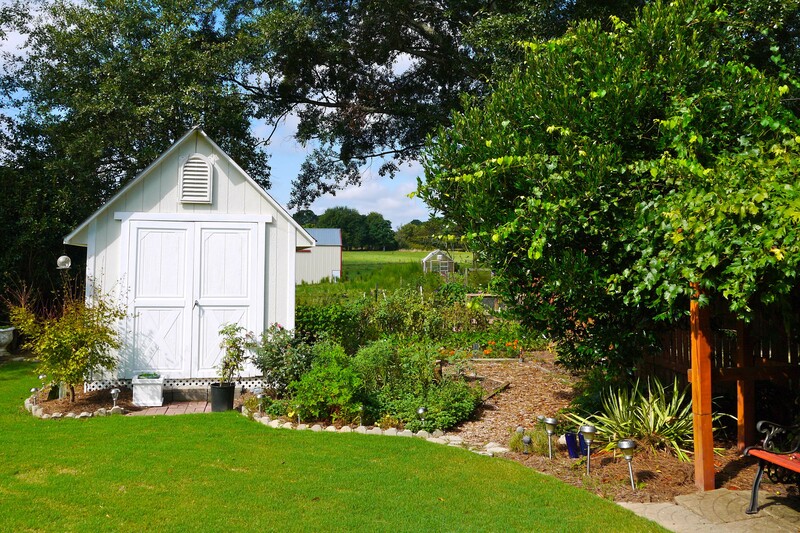 The Gwinnett County Master Gardener program provides volunteers as well as grant money for ongoing projects. Pets are welcome; be sure to use the waste stations provided along the way. Vehicles will be available to transport visitors along the trail. Come and see for yourself how cities can take unused and neglected areas to create a wildlife corridor that is also enjoyed residents of the community. In 2012, Mayor Johnny Crist encouraged the entire community to work together to create a community garden. Local volunteers helped plan and design the garden. 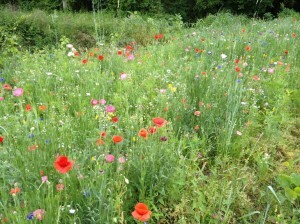 LCG consists of 55 raised beds, pollinator and herb gardens, fruit trees/bushes and a bee hive. The Gwinnett County Master Gardener program has provided volunteers as well as grant money for the garden. The stated mission for the Lilburn Community Garden is, “to create an opportunity to grow food for area residents and local food banks, to cultivate community interaction and fun across all ages, cultures and income levels, to provide a learning environment for organic sustainable growing practices, and to beautify Lilburn.” Visitors to the Lilburn Community Garden will find a wide variety of edibles growing in raised beds. Additionally there will be ideas for adding whimsy and fun to any vegetable garden. Jane’s garden is a “must see” for anyone interested in native plants! It is a Certified Native and Wildlife Habitat. Jane has acquired many of her treasures on plant rescues. Several of the natives are deer tolerant, allowing them to thrive despite the deer which frequent Jane’s yard. These indigenous plants are also well suited to our environment and thrive with little care. Visitors will enjoy seeing unusual natives such as Georgia savory and Franklinia tree. Jane has several native plants listed in Linda Chafin’s Field Guide to the Rare Plants of Georgia. These plants include Waldsteinia lobata (Barren strawberry), Asclepias purpurascens (purple milkweed), Coreopsis integrifolia (floodplain tickseed), Echinacea laevigata (smooth coneflower), Pachysandre procumbens (Allegheny spurge), Rhododendron prunifolium (plumleaf azalea) , Spirea virginiana (Virginia spirea), Symphotrichium georgianum (Georgia aster) and Helianthus verticillatatus (whorled sunflower). Jane’s favorites include many of the spring ephemerals such as trout lilies and the several varieties of trillium in her yard. As development encroaches on Atlanta, it’s good to know there is a safe home for many of these natives. Visitors here will learn to identify the vast variety of Georgia native plants and how to grow them at home. This charming Charleston style garden was designed by Tara Dillard using classic Southern plants. In the front yard, bed lines create a sense of enclosure and lead the eye to the front door in a welcoming manner. Classic plants such as boxwood, azaleas, many varieties of hydrangea, and both camellias sasanqua and japonica provide blooms almost year round. Seating areas tucked in pockets of shade provide pleasant spots to stop and rest. Entering the backyard through a charming arbor, visitors will hear the soothing sound of water. A formal fountain provides a focal point in the backyard. A koi pond adds an element of movement. Winding paths created with slate found on the property, guide visitors through a more natural area away from the house. A retaining wall created by stacking unopened bags of concrete will be of interest to the DIY visitors. This garden teaches the use of traditional formal design elements typical in historic Southern gardens. The many sun-loving native perennials in this garden provide a haven for declining populations of pollinators. Monarch butterflies enjoy the waystation that five different varieties of milkweed provide (Asclepias incarnata, Asclepias pupurascens, Asclepias tuberosa, Asclepias variegata, and Asclepias syriaca). The solitary native bee populations experiencing decline due to loss of habitat, find both food and shelter in this pollinator-friendly garden. The wide variety of birds flocking here create a sense of movement and sound that appeals to the senses, heightening the beauty of this garden. Karen does not use pesticides which would harm the native wildlife. When Karen purchased her home 15 years ago, the yard consisted of grass and holly bushes planted by the builder. She has worked through the years to reduce the amount of lawn by planting native trees, shrubs, and perennials she rescued as a volunteer with the Georgia Native Plant Society. Karen appreciates the luxury of having both a sunny area and a wooded, shade garden. This colorful, carefree and natural garden was created by working with the existing site. For instance, in low areas where neighbors’ downspouts drain into Karen’s garden, she created rain gardens rather than investing in costly regrading. Moisture-loving native plants soak up the water. A tupelo tree and Virginia sweetspire provide height in the area, while colorful native perennials such as turtlehead, blue-eyed grass, ladies’ tresses and meadow beauty thrive in the boggy environment. This is a wonderful garden to visit if you are interested in learning more about rain gardens and how you can use hardy indigenous plants well suited to local conditions. Visitors can also learn ways to support declining pollinator populations by providing them a friendly habitat.